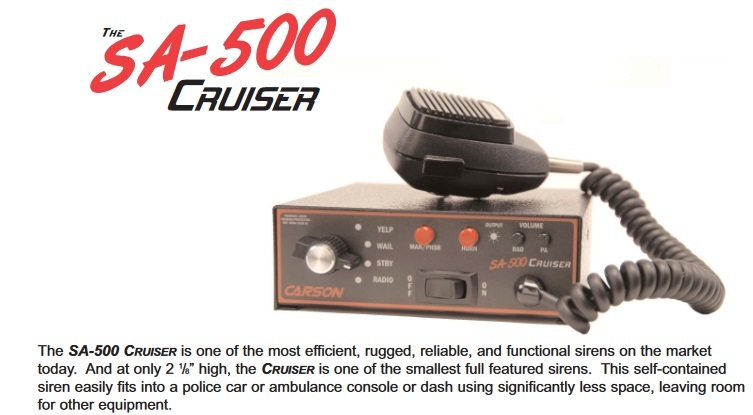 Click the button below to add the Carson SA-500 Cruiser Police Siren 100/200w Console to your wish list. The SA-500 Cruiser Siren is one of the most efficient, rugged, reliable and functional 100/200-watt sirens on the market today. And at only 2 ⅛", this self-contained full featured siren easily fits into a police car or ambulance console or dash using significantly less space, leaving room for other equipment. The SA-500 Cruiser siren features a rotary switch for selecting siren tones and radio, two momentary push buttons for tone override, separate volume controls knobs for Radio and PA, a master on/off switch and a noise-canceling PA microphone. The siren also features LED backlighting, the new Horn Ring Cycler 2 (HRC2) function that enables the driver hands-free control of the siren by cycling through the tones with the vehicles horn, and Siren Cutout / Park Kill to disable the siren when exiting the vehicle. All of the features are easily selected at installation using an internal DIP switch. The SA-500 Cruiser Siren is designed to power one or two 100-watt siren speakers and includes internal fusing, short circuit, high voltage and reverse polarity protection systems and an output indicator for diagnostic purposes. A wiring connector with screw-down terminals and optional mounting brackets for the siren and PA microphone are included. 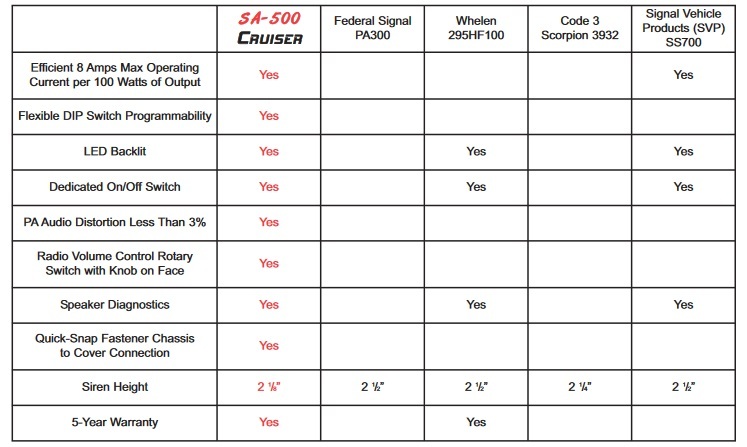 As with all Carson Sirens products, the SA-500 Cruiser is backed by a no-hassle 5-year limited warranty. NOTE: Sound clips demonstrate sound, not loudness.